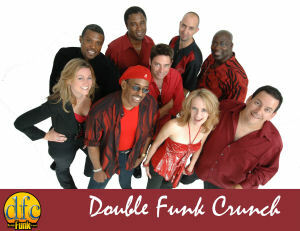 "Double Funk Crunch" is a 9 piece party band formed in 1997 to serve corporate, private and public clients who desire fun and entertaining dance music for their events. Originally established as a 70's disco band, they began to perform regularly at many private events, weddings and corporate parties in addition to their club appearances. DFC's popularity as well as their fan base has grown significantly and the word is out that they are a high energy, fun, party band that has expanded their repertoire to encompass all types of dance music from Big Band to Smooth Jazz, Latin to Hip-Hop, R&B to Blues, and Disco to Rock. DFC's music spans 30 years of top dance hits from the 70's to today! The band is fronted by dynamic blues/jazz vocalist Leah Tysse, powerful rock vocalist Laura (Ms. LA) Kuppinger, and the soulful R&B voice of David (Doc) Robinson. The 3 together are a high energy front line with choreography, outfit changes, and an awesome stage presence that is second to none! When you back up an awesome floor show and vocals with the likes of musical director and bass player extraordinaire Darryl Anders (Bonnie Hayes, Zigaboo Modeliste, and Tower of Power), jazz pianist and keyboard player Christian Boyd, funk and rock guitarist Jon Kuppinger, and the steadiest groove around by drummer Ron Smith (Legally Blynd, Sista Monica and the Gospel Hummingbirds), you're on your way to having one exciting party! DFC takes you to the next level by featuring the blazing horn section of veteran saxophonist Vince Lars (Destiny's Child, Toni, Tone, Tony) and trumpeter Jeff Lewis. Professional, flexible, dependable, and fun to be around are just some of the words used to describe DFC. Give us a call so you can become a part of the "Double Funk Crunch" experience!